In Android, you can easily toggle between mobile data and WiFi or even turn it off entirely as and when needed. 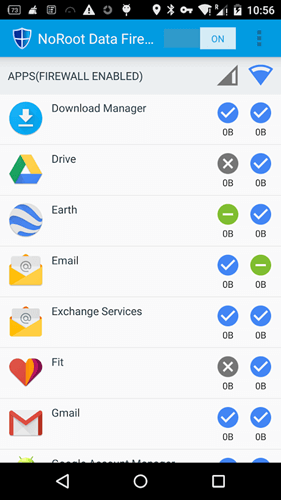 However, Android doesn’t offer any options whatsoever to better manage what apps can and cannot connect to the internet or how they connect. That doesn’t mean you cannot vet and control how your device is connecting to the internet. We are talking about Android here, there is an app for everything. 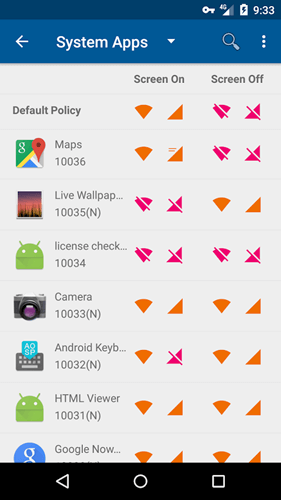 Disable Internet access for certain applications in Android? If you are running Android N or higher, you can block apps from accessing internet in the background from the app settings. Simply go to Settings > Apps, select the app you want to block background internet access Next, tap “Data usage” and enable “Restrict app background data”. Now, no apps will be able to use the Internet while they are running in the background. However, if you open the app, it will use the internet. And this is where Firewall apps come into the picture. So, here are some of the best firewall apps to manage internet access to the apps on your Android device. When it comes to a firewall for an unrooted Android device, NoRoot Firewall is one of the best in terms of features and the control you get. In fact, if you read my articles, this is not the first time I talk about NoRoot Firewall, partly because I personally use it from time to time. With NoRoot Firewall you can control what apps can and cannot connect to the internet. 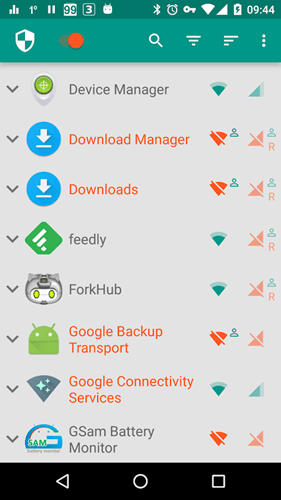 For finer control, you can restrict apps from connecting to the internet over WiFi or mobile data with just a single tap. Other than that, you can also block access to the websites and IP addresses of your choice. As good as it, NoRoot Firewall doesn’t yet support IPv6 addresses. So, it may or may not work on LTE connections. Also, the app can be overwhelming for new or beginner users due to all the options and filters. So, give yourself some time to configure NoRoot Firewall in Android. Price: Free, no ads, and no in-app purchases. NetGaurd is very similar to NoRoot Firewall in that you can block individual apps from access the internet via mobile data or WiFi. Compared to NoRoot Firewall, the notable things about NetGaurd is that it has a much cleaner user interface, better settings management, and most of all, it is open source. With just a single tap, you can either block entire network traffic or on a per-app basis. If need be, you can also block specific address for specific apps. Apart from that, NetGuard has other advanced options like the ability to filter IP packets, log internet access, manage internet access to system apps, app whitelisting and blacklisting, etc. If you are looking for a free, open source, and feature filled app then NetGaurd is for you. Price: Free and contains ads. Some advanced features are locked by default and you can unlock all of them or an individual feature with in-app purchases. If you are one of those who have successfully rooted your device and looking to better control your device internet activities then AFWall+ is for you. Using AFWall+ you can control internet access on a per-app basis, be it system apps or installed apps. 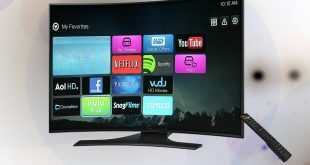 The app is very simple to use and has a ton of options to configure it the way you want. 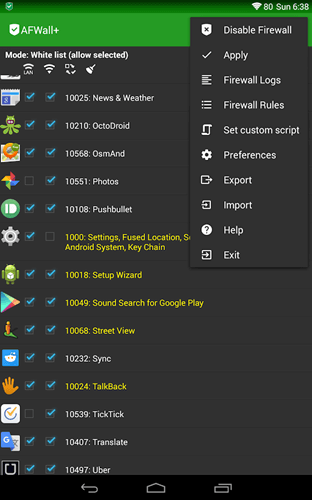 Some of the best features of AFWall+ are the ability to lock and protect AFWall+ settings, export rules, preferences, and profile settings, support for tasker and Xposed modules, hide applications, support for LAN, VPN, and tether, support for multiple profiles, widget to quickly switch between profiles, detailed logs and statistics, etc. 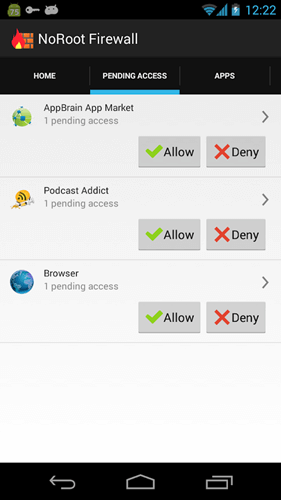 Mobiwol app lets you block individual apps from accessing the internet either through WiFi or mobile data. The appeal of Mobiwol is that it is very easy to use and there are no complicated settings to deal with. Just select the app you want to block the internet connection and you are good to go. You can block both system and installed apps. One thing I really like about this app is that you can see how much data each app is consuming and you can restrict individual app from using only a specific amount of mobile data. Once the app reaches that limit, it will not be able to access the internet via mobile data. So, if you don’t want to deal with all the advanced options and confusing settings and just want to block a few apps from accessing the internet then give Mobiwol a try. Price: Free and contains ads. NoRoot Data Firewall has a very clean user interface. By default, the app is configured to notify any app that tries to access the internet. You can select either to allow or block the access accordingly. 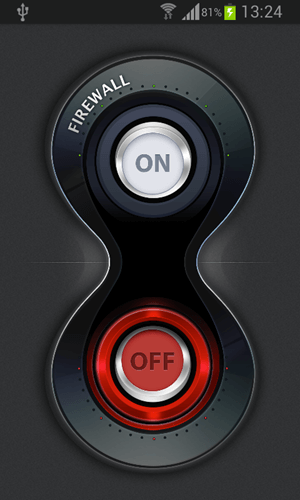 Of course, you can also control access based on individual apps, default behaviors for WiFi and mobile data. The other good thing about the app is that it logs network interactions of all the apps. Just tap on the app and select the “Analyze” option to see what websites or IP addresses a particular app is connecting to. Apart from that, you can block individual domains or IP addresses, block images from loading to save data, modify DNS server, throttle bandwidth, capture packets, and password protect NoRoot Data Firewall and its settings. Price: Free, contains no ads and in-app purchases. LostNet NoRoot Firewall is an easy to use and feature-rich firewall app for your Android device. Using this app, you can not only block apps from accessing the internet over WiFi and/or mobile data but can also restrict apps from connecting to any country or region. Just like with all the other non-root firewall apps, LostNet NoRoot Firewall uses local VPN to manage the network traffic. As such, it can also block ads and protect your device from any malicious domains or websites. One of the best things about LostNet NoRoot Firewall is that you can configure it to automatically block all apps from accessing the internet while you are sleeping, i.e, at night time or on your own schedule. The app also has other useful features like the ability monitor network traffic, capture packets, support for multiple profiles, instant alerts, ability to block untrusted networks, etc. If you are looking for a simple yet powerful app that requires no-root then you should try LostNet NoRoot Firewall. Price: This is a premium app and you can get it for around $0.80. like other apps on this list, NetPatch Firewall allows you to block and manage internet connection to individual apps. Of course, you can control both the mobile data and WiFi individually on a per-app basis. Unlike other apps, NetPatch Firewall lets you configure whether the apps can or cannot connect to the internet while the screen is off. 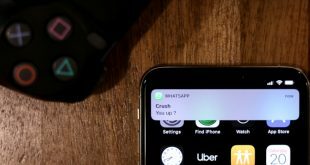 This feature is very useful when you want to tame apps from connecting to the internet when you are not actively using your smartphone. As soon as you unlock your device, apps can connect to the internet. Other features of the app include but not limited to custom DNS server, ability to create the domain and IP groups, detailed logs, block specific IP addresses or domains, etc. Price: The app is free and has in-app purchases. 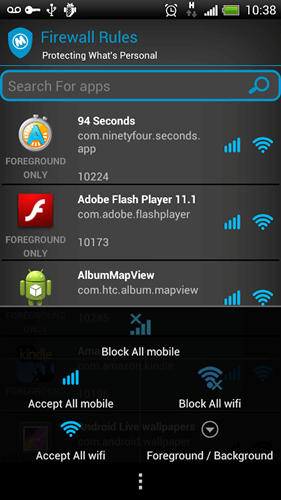 Kronos is a relatively new and simple firewall app for Android. If you don’t want to deal with confusing settings and advanced features then this app is for you. The app has a very simple layout and with just a single tap you can either allow or block an app from connecting to the internet. If need be, you can also block all the apps from connecting to the internet. 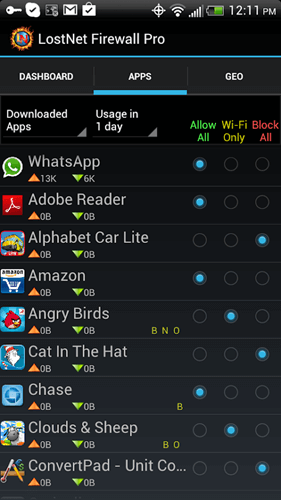 However, one thing to keep in mind is that the app has no option to manage mobile data and WiFi separately. You can either block the app from connecting to the internet or allow it. While you are using the app, it logs all the traffic. You can access the traffic logs from the Settings menu. Price: The app is free, contains no ads and in-app purchases. 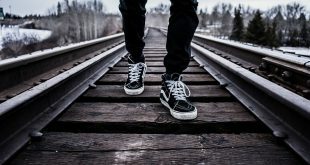 Not every one of us is looking to micromanage all the apps from connecting to the internet. 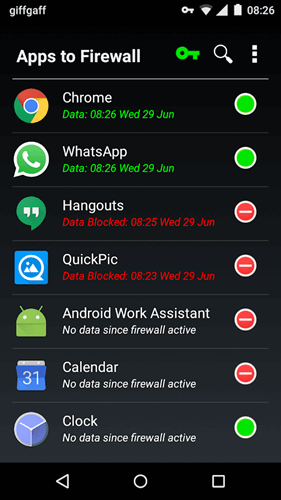 There will be occasions when you just need to block all the network activity on your device. NetStop Firewall is designed for such cases. Just install the app, turn on the firewall and you are good to go. Price: Free, contains ads, and no in-app purchases. That’s all for now. If you think I missed any of your favourite Android firewall apps then share it in the comments form below.